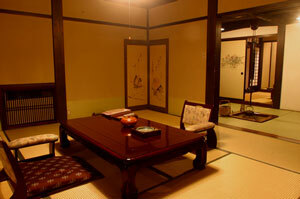 Staying in a Japanese ryokan is a highlight for a lot of travelers on Japan tours. It can be daunting to some, as it is a very traditional experience leaving many non-Japanese confused by the customs common at a ryokan. This guide will give travelers some information on what to expect when staying at a ryokan and tips on how to best enjoy the experience. A ryokan is a traditional Japanese inn that allows travelers to experience the elements of Japanese culture and customs, including staying in a room with tatami (straw mat) flooring, changing into a typical yukata (robe) following an onsen hot-spring bath, and sleeping on a futon on the tatami floor. Staying at ryokans is the perfect way to experience something new and to be immersed in the Japanese culture. Our quick how-to guide below will help determine if a ryokan stay would be right for you. Step 1: Find the right ryokan for you. Ryokans, like hotels, come in all shapes and sizes. There are budget no-frills ryokans, mid-range ryokans, and very high-end ryokans. Choosing one depends on your budget, and what kind of experience you're looking for. With ryokans, you will normally get what you pay for. The most luxurious, traditional ryokans can be extremely pricey (but the good ones are really worthwhile!). At the same time, there are some really good and economical ryokans. The experience will differ though. For the quintessential ryokan experience, plan to spend a little bit of money. 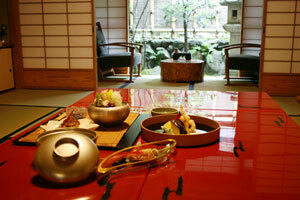 Budget ryokans do not normally include dinner, which is one of the highlights of a ryokan stay. So keep this in mind when selecting a ryokan! If you don't need dinner, then maybe a budget ryokan is OK for you. Check in time is usually at 3:00 pm on Japan tours. If you would like to have dinner with your stay be sure to check in before 5:30. If you check in later you will most likely not be served dinner, as all the food is prepared fresh, but you will still be charged for dinner. If you would like to check in early in the day, most ryokans allow you to leave your luggage while you go sightseeing and exploring before returning for the night. At a ryokan, guests typically remove their shoes at the entrance and change into slippers or zori (Japanese sandals). At many ryokans, the hostess or host will guide you to your room, bring you tea, serve your meals, and prepare the bedding in addition to any other service you request. In a traditional room guests sit on cushions on legless chairs. In most situations it is acceptable to sit cross-legged, but if it is a formal occasion you should sit with your heels tucked underneath you. You will usually be provided with a yukata, or cotton kimono, that is worn when sleeping or relaxing. Sometimes a tanzen, or a padded kimono, or haori, a kimono coat, is worn on top of the yukata. Most Japanese ryokans have large communal baths, which are very clean. There are separate baths for men and women. You can undress in the dressing room before entering the bath area. It is customary to rinse yourself off before entering the bath. Japanese baths are for relaxing, not necessarily bathing and getting clean. You wash and scrub your body outside of the bath so when you enter the bath you are already nice and clean. More modern ryokans are beginning to offer guests private baths and private open-air baths. If it is a hot springs resort, the hot spring mineral water fills the baths. A hot spring is an underground spring that is naturally heated, as it is warmed volcanically. 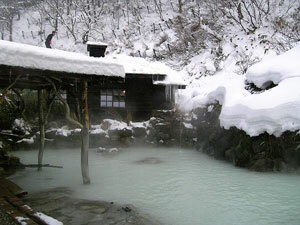 Ryokans are built around these hot springs that are renowned for their therapeutic and rehabilitative properties. Usually the baths are indoors, but some are outdoor baths which offer incredible natural scenery. Many ryokans also have Japanese gardens, constructed from trees, rocks, and other plants and natural materials. Everything is strategically placed and carefully designed. High-end ryokans include dinner (and breakfast), and this is part of what makes staying at a ryokan special. Ryokans typically charge for one nights’ stay including two meals. The two meals would be dinner on the day you arrive and breakfast the next morning. At most ryokans these meals are served in the guestroom, but at some ryokans the meals may be served in a large dining room. Typically the guest rooms serve as the living room, dining room, and bedroom all in one. Most meals consist of set menus, but many ryokans will be accommodating and adhere to special dietary needs. In some cases for breakfast, ryokans will offer a buffet-style meal. If you are uncomfortable with chopsticks or don’t know how to use them, you can simply ask the hosts for a fork. Rice is the main dish of the Japanese diet; vegetables, fish, and other meats are also popular. Each region of Japan has unique dishes and flavors. Multi-course meals consist of local and seasonal ingredients. 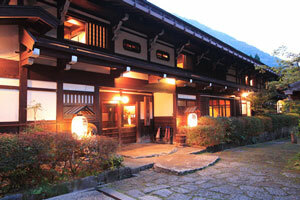 Any drinks ordered at a ryokan are not included in the price and will incur an additional expense. In a ryokan you will sleep on a futon placed over the tatami mats. The maid will set up your bedding for you. The futon consists of the kake-buton, or the quilt, the shiki-buton, or the mattress, and hada-kake, or soft blankets, and pillows. You should take of your tanzen when you sleep.